Every day our central kitchen makes sandwiches, salads, deviled eggs and more for you to enjoy. We use local, healthy ingredients. Youâ&#x20AC;&#x2122;ve always counted on us for the freshest milk and ice cream. Now, youâ&#x20AC;&#x2122;ll also enjoy our fresh to go items. The Friday Evening Cruise runs from 6:30pm until 9:30pm. The Saturday Evening Cruise begins at 6pm and lasts until 9pm. The Show ‘N Shine is held on Saturday from 8am until 4pm. The awards ceremony is held at 3pm in front of the announcer’s booth at the intersection of 6th Ave and Greenwood St. Raffle winners will be announced there at 3:30pm. Pre-registration is available through May 12, 2018. After May 12, registration forms must be filled out on the day of the event - NO EXCEPTIONS. For the Friday Evening Cruise, register at the Bi-Mart parking lot on 6th Ave in Junction City. On Saturday, Cruise registration is open from 8am until 7pm on Greenwood St between 4th Ave and 5th Ave. Drivers must be licensed and must present vehicle registration for proof of eligibility. We now accept credit cards. In the Show ‘N Shine, all makes and models are invited! In the Friday Evening Cruise, vehicles must be 1975 and newer. In the Saturday Evening Cruise, vehicles must be 1974 and older. 4WD vehicles and motorcycles are not allowed in either Cruise. All local laws will be enforced. While cruising you must follow all traffic laws, including all traffic lights. No breaking traction, no hydraulics and no open exhaust is allowed. All passengers must remain seated. If any rules are violated, you are at risk of being kicked out of the Cruise and may also be ticketed by law enforcement. No throwing of candy! 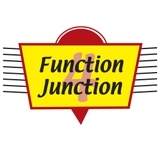 Function on the Web Go online to Function4Junction.com for info and photos. Download and print our registration form to learn when, where and how you can register quickly for this year’s event. Like us on Facebook to stay up-to-date with news! Crystal Freeman of Willow Creek Creative updates and maintains our website and helps document the Show ‘N Shine every year. Her web design company is online at willowcreekcreative.com. The 4th annual Truck Function in Junction has photos and details online at TruckFunctioninJunction.com. Photographer Jamie Hooper of Digital Dreams has an excellent archive of photos from past years posted at junctioncity.com/news/cruisin/. To view this entire magazine as well as past issues onscreen, you can download a PDF file at issuu.com/function4junction. he biggest little car show in the Willamette Valley just no hydraulics; no open exhaust allowed; and all passengers keeps growing and adding new events! Last year featured must remain seated. (see rules on pg. 3) the first Friday Nite Cruise, a special event that a lot of folks We are finally able to accept credit cards! You can now have been asking us to put together. The process took a long use your card for any and all purchases and donations, which time, but the Function 4 Junction Cruise is finally a two-night should make life a little easier for everyone. event. This year we’ve become partners with the vineyards who The format and times haven’t changed at all this year; we’re make up the Prairie Mountain Wineries group to offer a Poker adding to the event, not modifying it. As always, cars of any Run for the first time. This will be a Sunday daytime event year, make or model are eligible to enter the Show ‘N Shine, that runs until 3pm. Cars of any make or model can cruise a our all-day Saturday street show held in downtown Junction half-dozen vineyards in the foothills of the Coast Range west City. of town, draw a playing card at each stop and build a poker Also as usual, the Cruise that follows the Show ‘N Shine is hand that might win a cash prize. (see pg. 10) restricted to any make or model of automobile from the year We continue to host a Saturday Swap Meet each April in 1974 or older. And once again, no 4-wheel drive vehicles or the Junction City High School parking lot that features a 5am motorcycles are allowed in the Cruise. early-bird start and lasts until 4pm. As with all F4J events, The Friday evening Cruise a majority of the proceeds will go to support our College is restricted to vehicles made Scholarship fund. And we have a raffle to offer once again. Function4Junction from 1975 right up to today’s As always, you can go to www.function4junction.com to Board of Directors latest models. All other Cruise find registration forms and information for all of our events. rules apply: it will run from We’ll see you all again this year! Dan Alley 6:30pm until 9:30pm; no Dan Alley, President President breaking traction or burnouts; Function 4 Junction Corrie Lucas Vice President Cindy Alley Secretary Kari Rae Treasurer This year we will once again hold a Scholarship Raffle. The pool of prizes has grown to more than $1800 in gift cards, merchandise Bob Bell and services donated by nearly three dozen area merchants. Those Chris Brown numbers will keep growing right up until the day of the drawing – Jack Brown Saturday, June 2. Tickets are $1 each or 6 for $5, and can only be found at the heart of the Greg Dudley Show: the info booth in the US Bank parking lot at Sixth & Greenwood. Credit cards accepted. Jim Foster Prizes? If you like Dairy Queen’s Blizzards, you might win 50 coupons worth $3.50 each. Margaret Foster Golfers have a chance at a round for two at Fiddler’s Green. Brooks Auto Parts is offering Gary Jones a Car Care package of floor mats, cleaner and more. Hungry? How about lunch for two at Ally Lucas Junkyard Extreme or Fin’s Drive-In, and a chance at dinner for two at the Texas Roadhouse? Randy Thom There’s so many prizes available that your odds of winning are pretty good. Don’t miss out! Find new treasures, antiques, household things, plus Scentsy, LuLaRue, Paparazzi and many vendors with handmade soaps, lotions, dog toys, knits and garden art! Even a snack bar! rom its first event in 1995, the Function 4 Junction has been a celebration of American automobiles. It serves as a showcase for the craft of auto restoration and the passion that people have for their favorite make and model of car. But it’s mostly a chance to have fun while taking in the scene, examining and talking about cars and doing good things for the community in the process. It all started with a cruise along River Road south of town and an informal show in whatever empty field could be secured. Since 2006 the Show ’N Shine and the Cruise have been held within the Junction City limits, using the main street of our Willamette Valley town as the cruise route in the early evening. The Show ‘N Shine has grown so large that it needed to move from the high school fields onto paved streets downtown. As many as 15,000 people now show up every year to get a close look at perhaps 600 classic cars and watch the cruisers roll through town. It’s the second-largest event held in Junction City every year and has become one of the most popular car shows in Oregon. 2017 offered the first Friday evening Cruise for newer car models. The Show ‘N Shine goes on all day Saturday, centered in the heart of town. Awards are presented in the afternoon, then everything changes as people gets ready for the main event – the classics go Cruisin’! Spectators line both sides of Ivy St, the local name for the four lanes of Hwy 99 that run through town. The Cruise traditionally begins at 6pm with two antique fire trucks leading the way. Automobiles of every make, model and vintage at least 25 years old cruise up and down the main drag until darkness falls and the Cruise ends. In 2018 the fun will continue into Sunday with the inaugural Prairie Mountain Wineries Poker Run, a daytime event that sends cars winding through the wooded hills and valleys of the Coast Range west of town. With the support of thousands of classic and custom automobile fans, many local businesses, local service groups and volunteers, and hundreds of cruisers from near and far – the 2018 Function 4 Junction promises to be another memorable weekend for Oregon’s automobile enthusiasts! ver the years, it’s always been a core bunch of hard-working volunteer crews who make the Function 4 Junction possible. With two Cruises to manage now and with the first annual Poker Run to coordinate, this year those crews will be doing more than ever before. It’s volunteers who control the flow of traffic and monitor all the parking areas. People donating their time are the ones who operate barricades, provide information to cruisers and guests and register every vehicle. As the non-profit Function has grown, so has the need for more volunteers. There are positions available on the board of directors for anyone who wants to help with the planning and staging work that goes on all year. And there’s never enough volunteers on the day of the event, even though working the show and cruises can be more fun than just watching them. photo by Dale Rowe The husband & wife team of President Dan Alley (above with web designer Crystal Freeman) and Secretary Cindy Alley (below) provide most of the planning and logistics needed to make the Function 4 Junction a safe and enjoyable event. the crew at the city’s Public Works department. They make sure we are in compliance with all of the rules involved in staging an event of this size. We now accept credit cards for all purchases and donations! Advertise Your Classic Car Online! • • • • American Barricade Company is a family-owned business. From barricade rental to sales, we are committed to work zone safety and certified in traffic control. Thanks for letting us keep you and everyone else safe on our roads! time and money to spend on your favorite four wheels. First annual event offers a week-long window to cruise some vineyards, taste some wine and support a worthy cause The newest addition to the weekend of events sponsored by the Function 4 Junction is a unique type of Poker Run. In this version, drivers will visit five different wineries in the foothills of the Coast Range and try to fill out a winning stud poker hand by drawing one card at each stop. Players will need a stamp card and a designated driver for this event, one who can avoid the temptations of the grape for at least one afternoon. All of the proceeds from the raffle will go towards the F4J Scholarship Fund that helps local students pursue a higher education (see pg. 12). Drivers and players can visit any of the participating Prairie Mountain Wineries as early as Saturday, May 26 and right up through the final day of the event on Sunday, June 3. At every stop, draw a playing card from their deck and have your draw stamped on your card. Do that once at each winery and if your final hand is a high one, it could win a cash prize. Stamp cards will be sold for $20 and are available at Pfeiffer Winery and Bennett Vineyards, or in Junction City at The Courtyard on Sixth or at McKinley Printing on 5th Ave. Stamp cards will be available any business day after April 14. The grand prize is $500 for the card with the highest poker hand. The next two highest hands will receive $200 and $100 respectively. There will also be a special prize for the lowest hand submitted. Same-day registration will also be available from 8am until noon on Sunday in the parking lot behind the Junction City Library on Greenwood St. between 7th Ave. and 8th Ave. Winning hands will be announced at 3pm. All winners must be present to claim their prize. 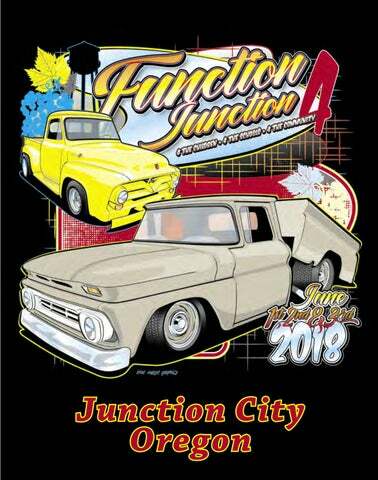 he Function 4 Junction is free for spectators, but the nonprofit organization behind all the events does raise money through entry fees, raffle tickets and ad sales in this magazine. Since 2005 a large portion of those funds have gone to support a college scholarship program administered by the Education Together Foundation. In 2016, the Truck Function in Junction joined the program. Every year an amount ranging between $1,000-$2,500 is awarded to several students who live within the Junction City School District. The number of scholarships and the amount of each grant depend on the funds raised each year and on the number of eligible applicants. In 2017 the F4J was able to support a total of five scholarships. Awards Night was held in May at the First Baptist Church in Junction City. Former F4J board member Crystal Freeman presented awards on behalf of the organization. Four scholarships were in the amount of $1,000 and went to Bailey Maxwell, Dulce Vaca, Elizabeth Knope and Jake Wiser. In addition, the Truck Function awarded $1,5000 to McKayla Edwards. All scholarships awarded by Education Together’s committee portraits by Jamie Hooper Bailey Maxwell, top left; Dulce Vaca, center left; McKayla Edwards, bottom left; Elizabeth Knope, top right; Jake Wiser, center right. require students to have high grade-point averages, plus they must submit a personal essay and a summary of their future goals. Although it’s not a requirement, the F4J scholarship gives special consideration to applicants interested in pursing a career in automotive-related industries. “A personal essay is the crucial element in determining scholarship winners,” said Gary Nelson, president of Education Together. “It gives the best insight into the character of each individual and what they hope to accomplish in the near future.” Last year, thanks to the support of sponsors, Education Together was able to award surpass its record of $88,000 to provide scholarships and grants to dozens of deserving students and local educational organizations. “In the past few years we’ve widened our parameters,” said photo by Crystal Freeman Nelson. “However, As a beneficiary of the Miss Oregon we wouldn’t exist at all if it weren’t for Scholarship Program, Harley Emery, individuals and groups Miss Oregon 2017, came to the Tri-County Chamber last year to like the Function 4 promote all scholarship programs. Junction who provide Ms. Emery made plans to speak at the money that funds this year’s Show ‘N Shine but will be all of our awards.” unable due to schedule conflicts. Viking Inn welcomes you! Join us at our newly remodeled location, open now under new ownership and new management Proudly serving a great selection of local brewery craft beers on tap Offering a fantastic menu full of options for every member of the family! 70’s and 80’s, presented by live announcers that know the music. JOHN MIELK E 3pm Music h 6pm is and inte tory, trivia, rviews, fro lifetime of exper m a ie nce. Traffic R eports. LLIN DAN MU • News On The Hour, Every Hour, 24 Hours a m 6am - 9a Day. We are the CBS Affiliate for Lane County. Dan’s Wake up to ic ff ry, Tra Music histo terviews, & Reports, In wledge. • Sports Play-by-Play Oregon State Football, Kno Kollege of Basketball & Baseball. Daily local sports report. features, The Twilight Zone Radio Drama, Starr Talk with Sonny Starr and KKNX produced Nam Rock. When a Local, State or National emergency occurs KKNX will break away from our regular format to become an all news and information source for you and your family. JOHN SU MMERS 12 noon -3pm A Radio Ve and Musicia teran n. Listen fo r John’s 3 of a Kind Monday - F riday. KKNX 105.1 FM , KKNX 840 AM & KEED 104.3 FM & KEED AM 1450 are Locally, Family Owned and Operated Radio Stations in the Eugene/Springfield Market. From OEM to body shop to auto enthusiast, Industrial Finishes understands "Car Guys." We know that the finish on your pride and joy is much more than just paint. That's because it's more than just paint to us too. Whether you repair cars for a living or restore them out of love, Industrial Finishes has the materials, expertise and passion that you've come to expect for over 50 years. Experience the advantage. The Nomad was an unusual model to begin with, a two-door, six-passenger car that was part of the popular Tri-Five Chevys produced from 1955-1957. Tri-Fives were available with the first version of Chevrolet’s small-block V-8. The Nomad was actually considered to be a sporty automobile and might be the coolest production wagon ever built. The first Nomad was the concept of designer Carl Renner, working under Harley Earl. That concept combined a Corvette front end and a station-wagon rear, but the production models were based on the Bel Air front. About 8,386 were built in 1955. The exterior body of Ken’s masterpiece has been “... slightly modified from the original,” he says with a smile. “I do that to all my cars. I just like that sleek look.” There are no door handles or key locks, and no visible gas tank opening. The doors open with a remote controller and you fill the tank through an re-plumbed fuel opening hidden behind a taillight that also opens with the remote. Proudly serving Junction City and the surrounding areas! Ken built his first hot rod back in 1989, a ‘34 Ford that he still owns. There’ve been a half-dozen other cars that followed over the years, each one built to Ken’s high standards and personal taste. The Nomad was purchased five years ago from a friend in Junction City. It was in bad shape, really rough inside and out, and it took Ken twice the time he usually spends on a project car to get the Nomad ready to show. Ken Jones has a knack for building awardwinning automobiles such as this 1935 Ford dark metallic green pickup truck that was the Best Interior winner at the Show â&#x20AC;&#x2DC;N Shine in 2013. Ken also built an impeccably detailed 1955 Chevy 210 (top photos) that is now owned by Jeff & Tina Parrett of Walterville. They brought it to the Show in 2012 and left with both the â&#x20AC;&#x2DC;50s Modified Runnerup and Best Interior awards. June 3 ~ Function 4 Junction Winer y Poker Run July 15 ~ Poker Run and Car Show (Run for Yaakov) July 22 ~ Habitat for Humanity Blues Build Concert New Friday Cruise Nights to be announced! This 2018 book compiled and published by Linda VanOrden includes history and actual stories about growing up and living in the greater Junction City Area in the 20th Century; 8.5x11x1 inches, 383 pages, 207 illustrations, fully indexed. Our goal is to sell quality products at a reasonable price with service you can trust! Medicare made easy – give us a call! Jim and Suzanne’s 1961 Corvette has won a shelf full of top awards including several “Best of Show” at events around Oregon and two ”First in Class” trophies at the prestigous Concourse d’Elegance show in Forest Grove. •	Custom-ordered polished aluminum Edelbrock Chevrolet 350 CID, 363hp includes dual-quad carburetors, roller camshaft & lifters, polished C-26 Dual Quad intake manifold (oil filler boss at front) and headers. •	Serpentine belt pulley system includes polished aluminum, 1-wire 140 amp alternator, water pump, power steering pump, Sanden AC compressor and power steering. •	Independent front suspension from Jim Meyer Racing with power rack & pinion steering, power disc brakes, QA1 adjustable coil-over shocks, sway bar and dual master cylinder. •	700R4 automatic transmission with overdrive. •	Alpine AM/FM/CD stereo with Alpine amplifier in the carpeted trunk, plus eight speakers (two in dash, two in kick panels and two in each headrest). 1960 Chevy Impala. Cascade Green. 400 cubic inch small block Chevrolet engine with GM fast-burn aluminum heads, GM aluminum intake, Holley 750. Approximate 545 hp. Drive train: Tremec TKO 600 5-speed manual transmission, Mcleod dual friction clutch, Quick time scatter shield. Ford 9” rear end with 389 posi-trac. Wildwood 4-wheel disc brakes, Custom 4-link suspension with Ride Tech air ride, Ride Tech air management system. Flowmaster exhaust. Boyd Magneto wheels; 20x10 rear, 18x8 front. In 2017 the Function 4 Junction grew in a muchanticipated way. The owners and builders of recent-model automobiles have long been asking for a chance to go Cruising just as their classic counterparts have been able to do since the F4J began. They got that chance last year as cars lined up for the inaugural Friday Cruise up and down Junction Cityâ&#x20AC;&#x2122;s main drag and through some of the residential streets. Dozens of models from 1975 and newer years rolled out, including a few that looked to be fresh off the showroom floor. Photographer Curtis Reed featured Mike’s van in this 2010 road-bending, fish-eye lens panoramic view of the Cruise. More recently, Richard L. Smith captured this view of Dave’s truck in the light of sunset on a Wednesday evening Cruise-In at their corner lot. Junction city Affordable Post Frame & Stud Frame Building Packages to protect your investments, hobbies & family fun! Lodge 2238 Chapter 487 The Loyal Order of Moose is a private fraternal and service organization founded in 1888 and dedicated to bettering the lives of children and the elderly in need, to helping make our local and international communities better places in which to live and raise families, and to providing wholesome family recreation at a modest cost. State Farm® has a long tradition of being there. That’s one reason why we’re proud to support the Function 4 Junction. Big or small, we print and ship it all â&#x20AC;&#x201C; and we have the lowest UPS Retail Rates in town! 33289 Hwy 99 E • Tangent OR 97389 www.nwautofab.com • 541-791-1424 • mikes@nwautofab.net • Custom Body Modifications, Rust Repair, Bodywork & Paint • Suspension Modifications, Frameclips, Airbags • Engine Conversions, Fuel Injection, etc. • Tube Bending • Brake Systems • Custom Wiring • Fuel Tank Fabrication • Air Conditioning Systems • Fiberglass Repair • Much More! Your one stop shop for all your custom needs. From maintenance to frame off customizing. Award winning service for 20 years. We’ll make your dreams a reality. It opened with the name “Junkyard Dogs” on May 18, 2006 and was an immediate success, so before long they were able to add burgers to the menu. Six years later a dining room became necessary after county officials took notice of their operation and made them build up the place to meet county codes. “We filled the dining room Photos courtesy of Kim and Craig, who just with shabby chic junk, art, want to feed you some really good food... antique collectables and just downright weird stuff,” said Craig. “All clean, re-finished and very cool. Upon reopening we introduced our new designer burger line and fried cheeses, then pumped up our brats, dogs and fries menu, too.” The visit by Fieri came after the TV show’s production company got curious over the hundreds of emails and photos sent to their Chicago office by happy customers who raved about the food. They decided to do a show after realizing that the diner was producing excellent food from a tiny kitchen and doing it in a most unusual location. Craig and Kim decided to feature their impossibly large, 5-1/2 pound DDD Burger stuffed with Craig calls “...our one-of-a-kind methodology” along with the item that he considers their greatest creation – Grill Fried Cheese Crust Pizza. Fieri’s reaction? “Let me get this right. Your mom owns this little town in the middle of nowhere and your kitchen is built in a race trailer and you’re creating one-of-a-kind, unique dishes here...” He was absolutely right, and after sampling the food Fieri declared the creation to be the best of the Big Burgers he had featured in 330 episodes since the start of Diner’s, Drive-In’s & Dives. His review had a huge impact. Over 70 local merchants under one roof, offering a variety of hand crafted gifts, full service florist, clothing boutique, antiques, jewelry, beading, scrapbooking & supplies, books, art and much, much more!! DAIRY QUEEN BRAZIER 1025 IVY ST JUNCTION CITY, OR 97448-1930 All trademarks owned or licensed by Am. D.Q. Corp. ©2010. ®, TM, and © 2010 O.J. of Am. Corp. ©2010. ®, TM, and © 2010 O.J. of Am. small Smoothie, with any combo meal Corp. ©2010. ®, TM, and © 2010 O.J. of Am. The pool of prizes has grown to more than $1800 in gift cards, merchandise and services donated by nearly three dozen area merchants. Those numbers will keep growing right up until the day of the drawing – Saturday, June 2. Tickets will only be sold during the Show ‘N Shine that day. Tickets are $1 each or 6 for $5, and can only be found at the info booth in the US Bank parking lot on the corner of Sixth & Greenwood. The annual magazine of the Function 4 Junction Car Show 'N Shine and Classic Cruise through the streets of downtown Junction City, Oregon.